Good Morning Everyone! Are you guys ready for the big day? I finally have the halls decked, the baking boxed, the wine fridge stocked, the party hosted, and the presents delivered. Now it's time to do some serious chillaxing. 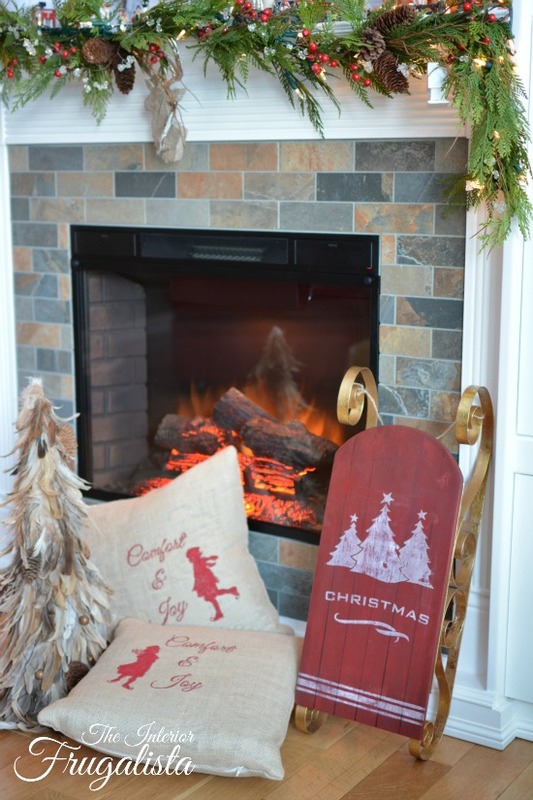 Before I get too comfy in my armchair by the fire, I thought I would share a tour of some of our holiday decor, most of it handmade by Moi because It's A DIY Christmas after all! Let's start right where I'm sitting by the fire. If you only saw that wooden sleigh two weeks ago. I picked it up at Goodwill for $15.00 and it was UGLY. First I had to eject poor dusty old Santa and his sack of toys from the sleigh. Then I sanded, painted, stenciled, and waxed er all up and she's as good as new. You might recognize the stencils I used from Funky Junk Interior's stencil line. The Skating Silhouette Pillows I made last year in the wee hours of the morning during a sleepless night after consuming one too many a coffee at Starbucks with a friend. 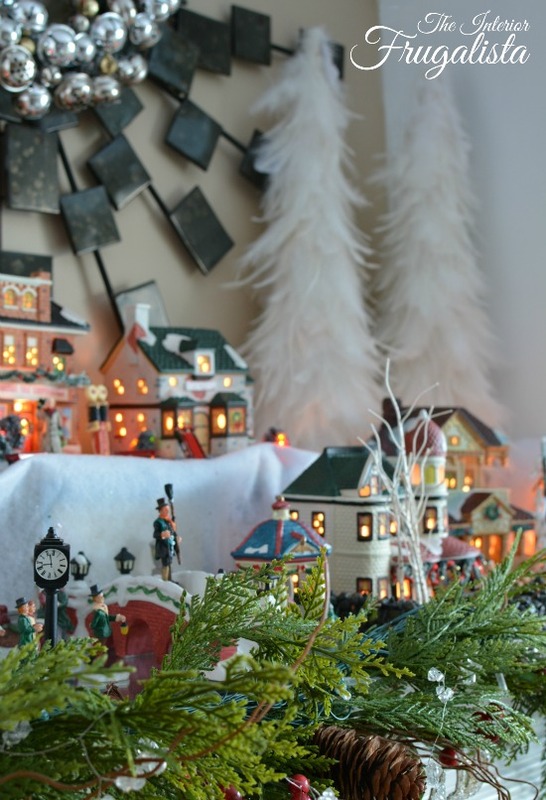 I set up our Dicken's Christmas Village on our fireplace mantel for the first time. A lot of the buildings and figurines were passed down from my Mom & Dad. Normally I set it up in our basement family room underneath our second Christmas Tree, but this year I gave all the basement decorations to my children because we hardly go down there since they left the roost. 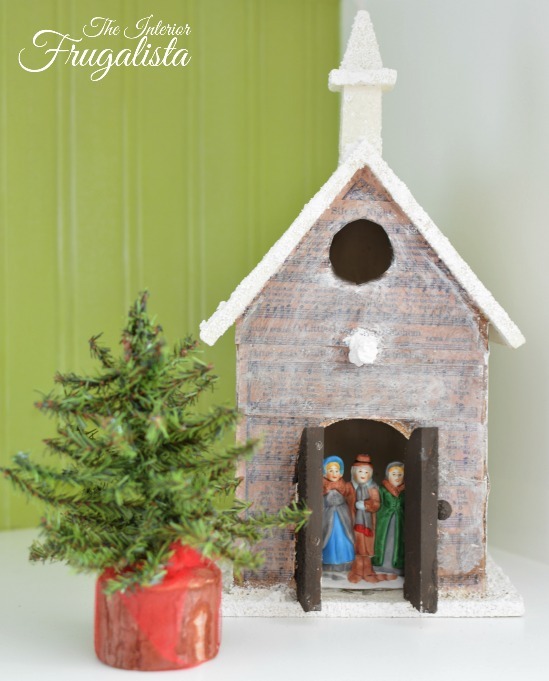 On one of the bookcase shelves flanking the fireplace, I added a wooden church that I decoupaged with sheet music and added snow-tex and glitter. 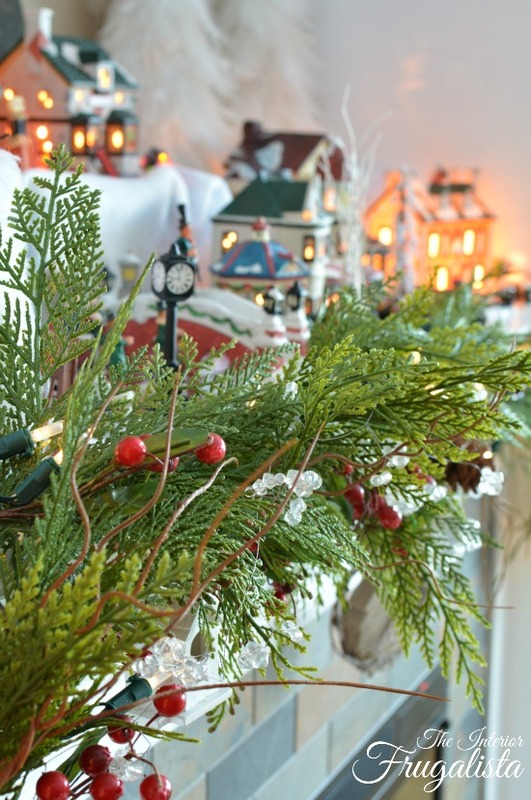 The miniature tree was a craft the kids made during our annual sleigh ride at Fort Edmonton Park many years ago. 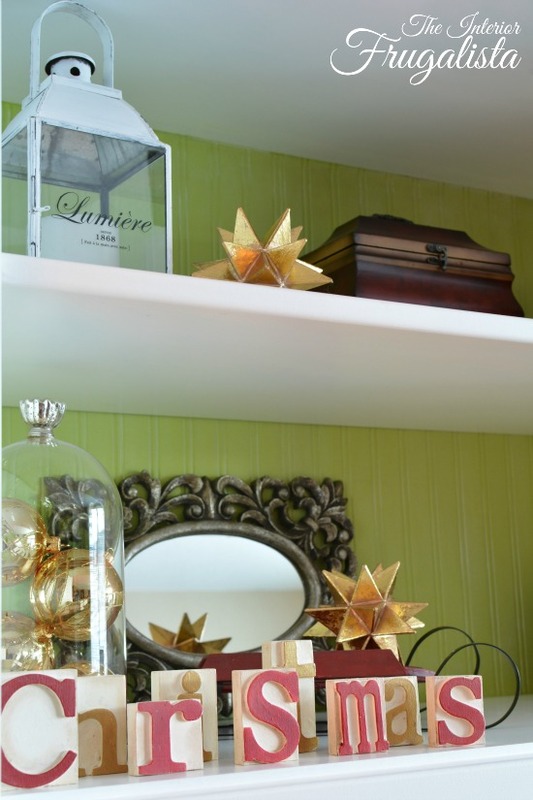 On another shelf, I filled the inside of a cloche that I made from a glass dome and furniture knob with gold Christmas Balls. The wooden sleigh was another Goodwill find that I painted red. The block letters were purchased two years ago at the Dollar Store and painted Holiday Red, Metallic Gold, and old white. In front of the window are the Armchairs that we picked up for a song and reupholstered. 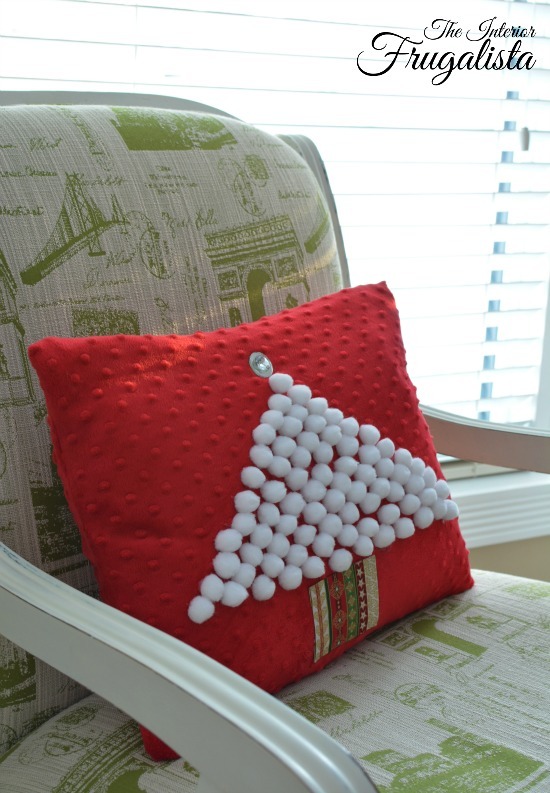 To add a festive touch I made pocket pillow covers with red chenille leftover from stockings I sewed a couple of years ago. I hot glued white pom poms to the front and using heat & bond, attached leftover fabric from table runners that I made last year. The tree top is a round mirror with a clear gemstone sticker glued on top. On the other side of the fireplace is our Christmas Tree. This is the first year in a long time that I haven't wrapped wired ribbon around it. I've got to say, it was quite liberating! 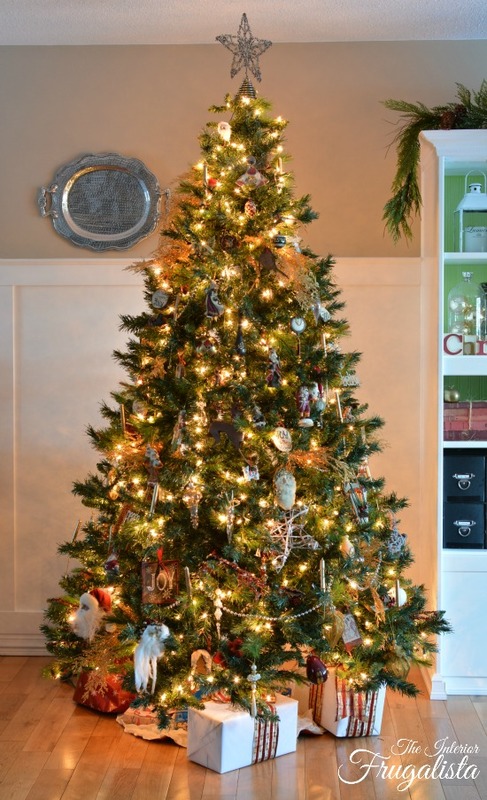 This year I wanted a less formal tree using decorations from my childhood, vintage decorations purchased here and there, DIY ornaments, and cherished ornaments given to us over the last three decades from family and friends during annual ornament exchanges. Every decoration on the tree has a story! 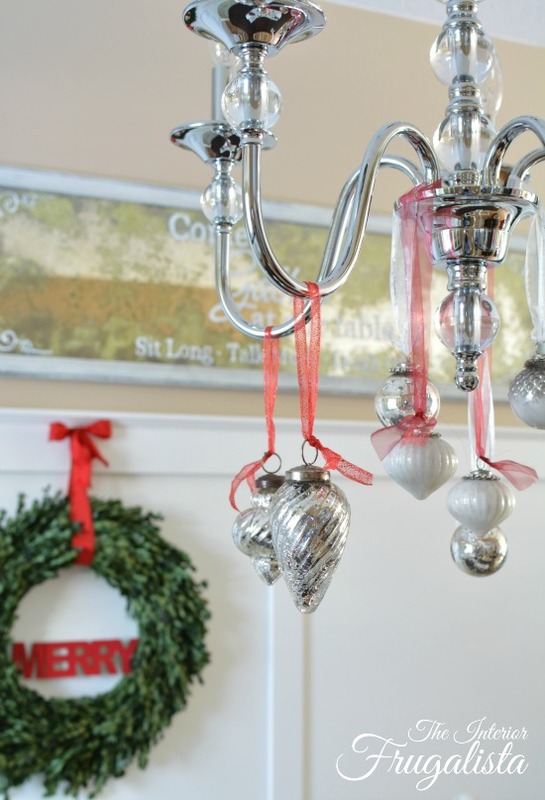 Let's move into the dining room where I've hung mercury and milk glass ornaments from the chandelier with red and white ribbon. 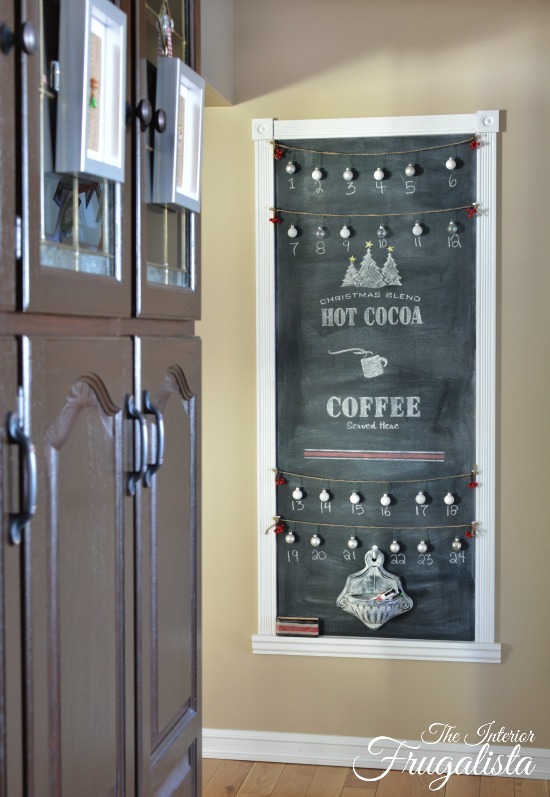 From the dining room, we move to the kitchen where I enjoyed some chalk therapy one afternoon. There is those stencils again! 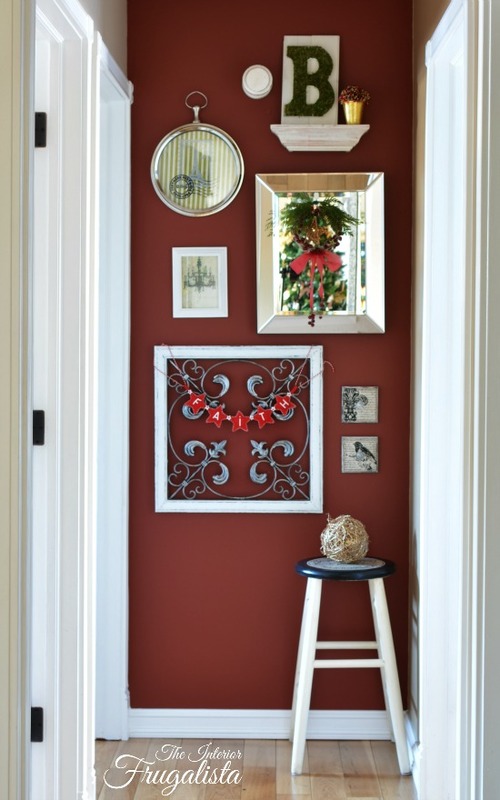 Down the hall on the way to the loo, I added some Christmas to our gallery wall. The wreath hanging from the mirror came from my sweet friend in Germany. The felt FAITH banner was made by another sweet friend from the UK. 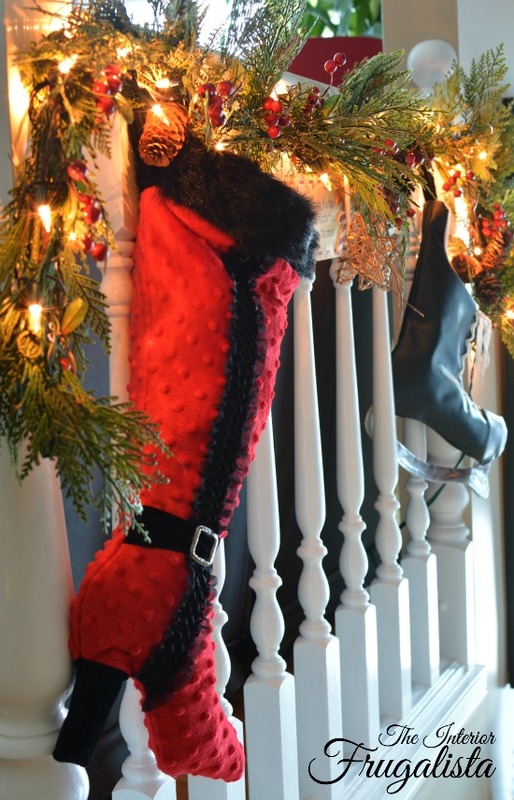 As you head down the stairs to our front entry, I decorated our banister with lighted evergreen garland and hung the chenille Stiletto and Hockey Skate stockings with care. 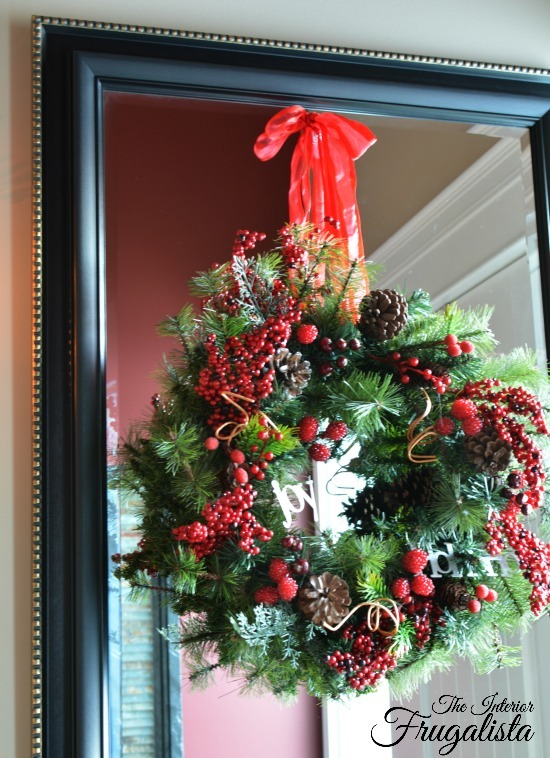 My thrift store wreath embellished with holiday picks and ornaments hangs on the large entry mirror. 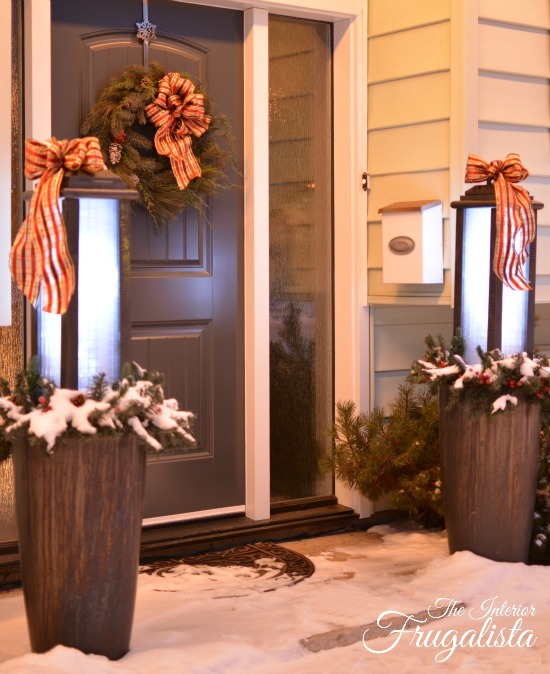 You may remember these Large DIY Holiday Lanterns from the Home For Christmas Tour last week. They light the path for guests during the holidays and long into the dark winter months. 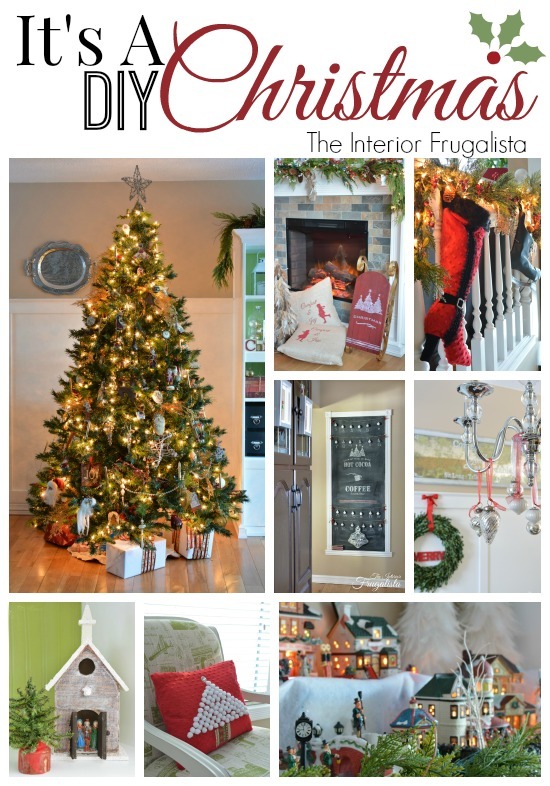 If you like my DIY Christmas decorating ideas, please share it with a friend and/or save it on Pinterest. You may also like the fun Wood Slice Holiday Coasters I made for cocktail hour. I also turned patio candle holders into Large Lighted Holiday Ornaments. May the peace and blessings of Christmas be yours!